Knitters, how do you find motivation to complete WIPs that have gotten…monotonous? Do you complete them? Or do you have a stash of hibernating, nearly complete projects? 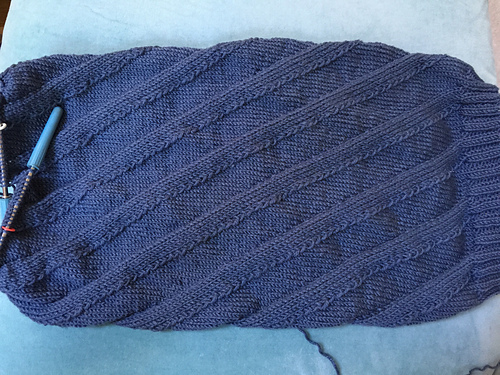 I don’t usually have an issue knitting through to the end, but I definitely lag behind when it comes to weaving in ends and doing seaming and finishing bits (case in point: my Capucine, languishing without its tassels). Like many “efficient” knitters, I tend to gravitate toward projects that have minimal finishing needs, and prefer using grafting/Kitchener stitch and the like when possible. I just measured my Not a Buff and it is, conservatively, 15.5″. That means I have only 3.5″ to go before switching to rib, and only another inch or so after that to be done. But man, does it feel like pulling teeth. I keep browsing patterns and projects on ravelry, pondering what’s going on the needles next, dreaming of the gems in my stash and how they will morph into projects. I just want it to be done already! Any tips for gritting through? Or recommendations for my Netflix queue? A few days ago, I was looking through boxes of knitting and craft supplies that have remained packed since our move three years ago. One was marked WIPs, and I sort of dreaded opening it. I’m glad I did, as I found the ggh tajmahal I’m using now (in a previously unfinished and abandoned sweet pea), as well as an in-need-of-frogging monica in Brown Sheep Cotton Fleece. However, there were a few other things in there that brought a little sadness and anxiety and I’m trying to determine how to handle them. First, an unfinished unbiased that I made out of wool that my mother brought back for me from Scotland. The wool is a beautiful heathery charcoal color but it is very very coarse. I have a high wool tolerance, but this is out of my league. So, I thought that making a bag out of it would be a good idea. I modified the pattern as I didn’t have quite enough yardage to finish. As a result, the V in the middle makes the bag too shallow to really function. I had this thought that I would line it with rectangular patterns that would cover the open V shape, but never got around to it (see above re: finishing; I’m even worse with doing linings/backings). In the meantime, my style has really changed and I can’t see myself ever carrying a handbag anymore, and so it sits. I suppose I should frog it, but it’s hard to sacrifice the work that went into it. 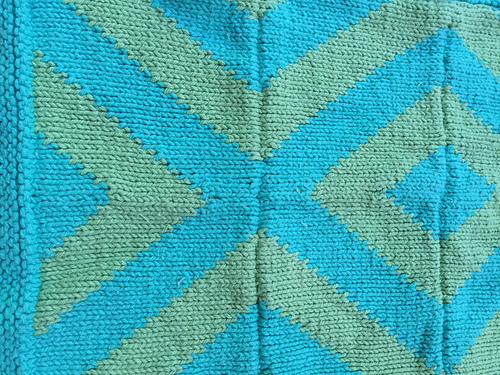 Second, I found my zigzag blanket that was intended for one of my twin nephlets as a baby (they are seven now, I think). I worked so. hard. on that blanket. 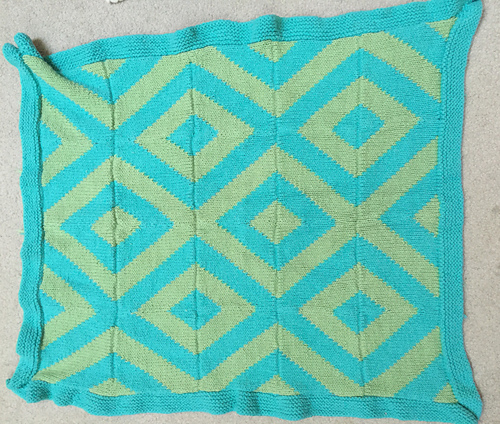 I got through so much of the finishing: I seamed a million or so squares together, worked in a lot of the ends, picked up and knitted a border…but never put the backing on. And so it sits. I will try to finish it sometime as I really love it and want it to be put to use somehow. 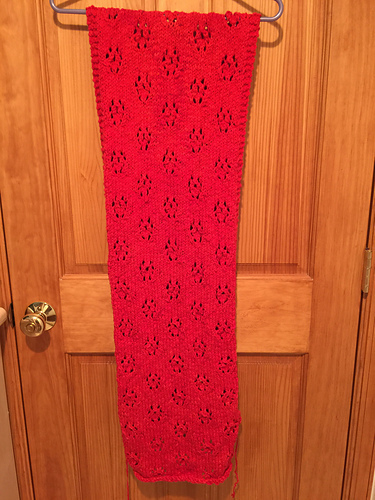 Last, a scarf/stole that I knitted while a close friend’s mother was critically ill. It’s in Araucania Nature Cotton. 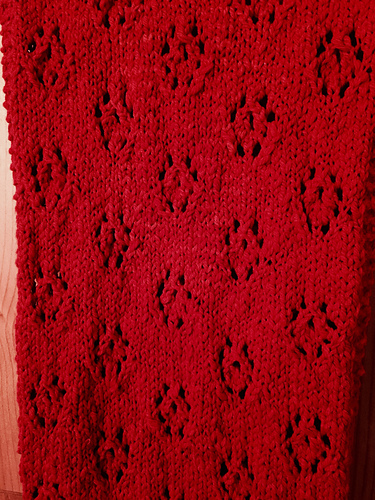 I think I used a BW pattern called Rosebud? Something to do with roses. In any case, I had intended to give it to her when she recovered, but she passed away. I planned to give it to my friend instead and all this time (it’s been six or seven years) I thought that’s what I had done. So, when I found it in that box, a wave of sadness hit me. 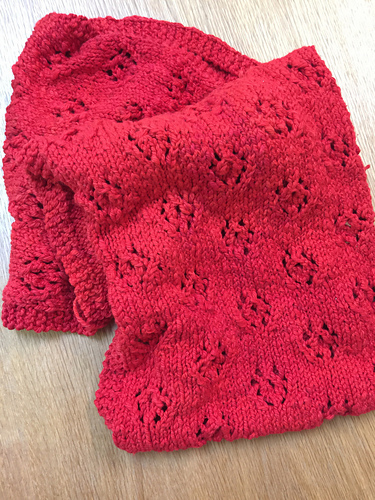 I had finished knitting it but never weaved in the ends or blocked it. I think I will finish it and give it to her, but I’m sad that I never did before. The positive side of all this is that there is so much potential here, in all these nearly-done WIPs. There’s something extremely gratifying about completely finishing a project and then sending it out into the world to begin its new role. Handmade things go from projects that bring me joy to FOs that can potentially bring others joy (or me, when I make something for myself…it does happen sometimes). I love that I can make things that are both beautiful and useful, and also special because they were made for a purpose for someone. Wait, What Did I Miss??? You have some awesome projects nearly finished. 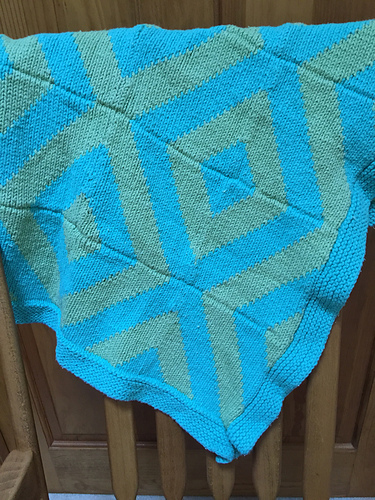 I am getting ready to go look at the pattern for that zigzag blanket. I really like it! As for the netflix queue, I saw a list of netflix recommended shows just yesterday, and I am giving this bbc show called Death in Paradise a try. It looks promising! Thanks–the zigzags were fun. The original pattern has more than just two colors to it. It’s very bright and cheery. I think I’ve already watched your Netflix suggestion–it was pretty good, if I remember correctly!